Apart from Google Nexus 6P, Nexus 5X, Nexus 6, Nexus 9, Nexus Player and Pixel C owners, the rest of the Android family is probably wondering when Android Nougat will show up on their devices. The OS was released over a month ago and up to now, there is no non-Google smartphone that has received the update. However, it seems this is only going to last for a few days, at least according to a leaked Sony presentation that shows off the company’s Android Nougat release schedule. According to the leaked images, the Japanese tech giant may end up being among the first, if not the first, to roll out the new Android Nougat. Whether this will only be happening in Slovakia alone or other European and global regions will be included in the update is still unknown. But for sure, the Nougat update should be hitting Sony Xperia devices as from next month. Assuming this schedule will be used in all markets, we can say that Sony Xperia X Performance will be receiving the update as from October. 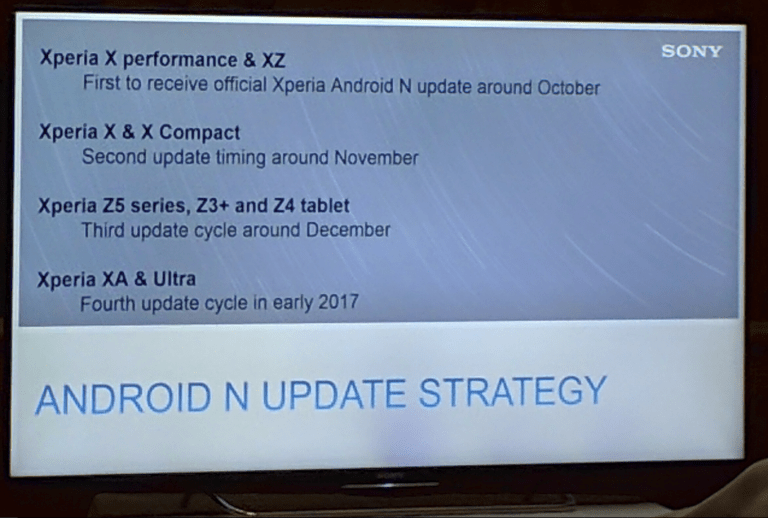 While there is no specific date, the leak also confirms that Sony Xperia XZ will be joining the X Performance in receiving Android Nougat during the same month. Those using Sony Xperia X and Xperia X Compact can expect to receive the Nougat update before the end of November. The 2015 Sony Xperia Z5 will be joined by the Xperia Z3+ and Xperia Z4 Tablet in receiving the OS in December while those on the Xperia XA and Xperia XA Ultra will have to wait until early 2017. Like the dates, there is no mention of the months that the latter group will be receiving the update, but it shouldn’t go beyond Q1 2017. There is no word on the exact regions that this OS will be rolling out to when it comes to the said devices. However, it is possible that Europe will receive the update ahead of the U.S. and North America in general, but this should only see differences of weeks or maybe months. This could be further delayed if the handsets are locked to a given carrier, but for those using the unlocked variant, take note of these dates. As usual, expect any changes in the dates, but they should be communicated, just in case. Next Next post: Samsung Galaxy Note 4 vs. Xiaomi Redmi Note 3 – Can Samsung Survive the Battle?